Devotees worshiping the setting sun. This process is known as Argha dinu. 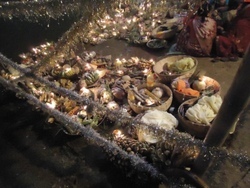 Offerings made to the sun god in Chhath. 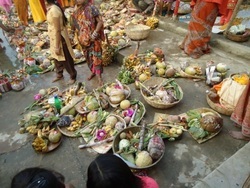 Offering arranged during the Chhath Puja. 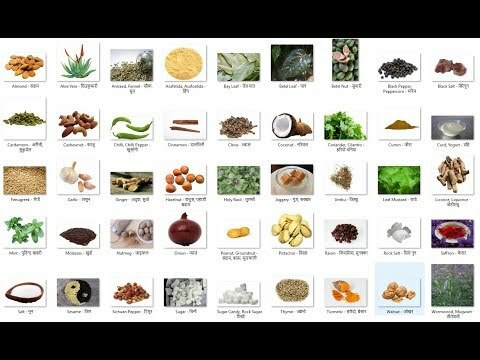 -->The offerings of fruits and flowers are made in a kuniya and even those who do not keep fast can offer a kuniya to the god through those who keep fast. However, one needs to buy or pay for the kuniya and its contents themselves." src="http://bossnepal.com/wp-content/uploads/chath.jpg" width="500" height="375" srcset="http://bossnepal.com/wp-content/uploads/chath.jpg 500w, http://bossnepal.com/wp-content/uploads/chath-200x150.jpg 200w" sizes="(max-width: 500px) 100vw, 500px" /> Kuniyas made ready for the offering. The offerings of fruits and flowers are made in a kuniya and even those who do not keep fast can offer a kuniya to the god through those who keep fast. However, one needs to buy or pay for the kuniya and its contents themselves. 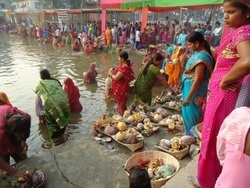 Chhath puja is performed on the beautifully decorated booths around the pond or at the bank of the rivers. 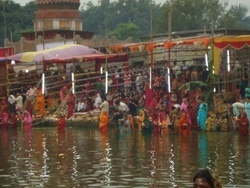 Devotees worshiping the god by submerging themselves in the pond. Those who keep fast are to stay in that way until the prayer is over. It is done for the setting and the rising sun. 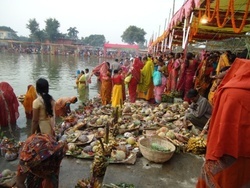 Those who do not have fast cannot go into the river while the puja is being performed.